Function Prototyping is the process of declaring a function for the compiler to understand the function name, arguments, and return type. A function can return a value using the return statement to the main program. The function does not return value if the return_type is void. A function_name is a user-defined name (identifier) for calling/using the function. The function name and the parameter list together constitute the function signature. A parameter is variable which holds data. The Argument transfers the data from the main program to the function definition. Actual arguments: The main program variables(arguments) are known as the actual arguments during the function call. Formal arguments: The Function definition variables(arguments) are known as the formal arguments. When the main program is run, the program reaches the function call statement and invokes the function and passes the control to it. The actual function code block or function body is called as the function definition. When the function call is triggered by the compiler, the program control is passed to the function definition. Then the compiler executes statements in the body of the function and the program control returns when the return statement or closing braces(}) is reached. 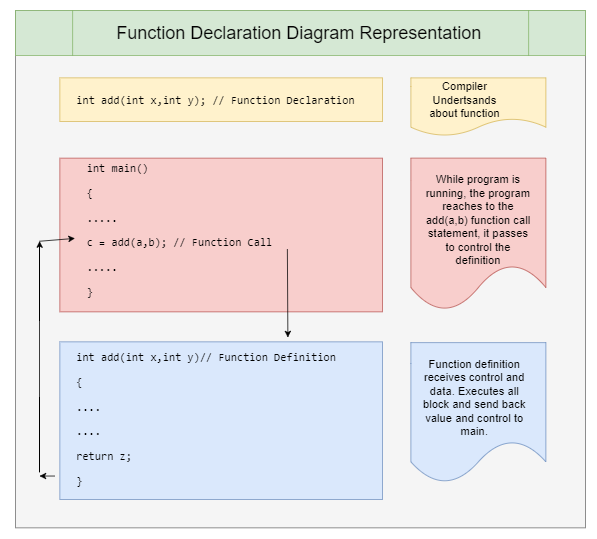 Function Declaration is for compiler understanding about function. Here compiler understands function name is "add", which has two number of arguments with int and return type is int. we declare two three variables for pass values a(10) and b(20), Third variable c is for receive return values. While the program is running, the program reaches to the add(a,b) function call statement, it passes to control the definition of the add(int x, int y). Here a and b are actual parameters, that values pass to int x and int y. We cannot access a and b values in the function definition. z and y are formal parameters. now x and y have the same value of the a and b. x and y values are 10 and 20. This line receives control from the main program, x and y contain a and b values respectively. x and y are the local variables We cannot use x and y values outside the function definition. We have declared new local variable z for assign value of a+b; now z value is 30.z is a local variable We cannot use the x value outside the function definition. now z value is 30. that value returns to the main program. Which is received by c.
After return statement, all local variables(x,y, and z) scope ended. here just printing value of c. c value is 30.